Want to know the reason why so many Snowbizz guests return? We’ve been running our own exclusive ski school for over twenty years and is the major reason so many guests return year after year. Our director Michel is present every morning; chatting with parents, giving feedback and checking all our children are happy. Michel works with a team of hand-picked instructors who offer small, friendly classes which are exclusive to our Snowbizz guests. We cater for three year old beginners, through to children with special needs, right across to race training children who have joined elite UK squads. We also run a separate adult ski and board school. In the early 90’s, Elodie, our daughter, attended the local ski school and with the help of an amazing intructress, her skiing really took off. The following year in a very large group with a very grumpy old man it was a complete disaster. We knew that we needed to do something radical if we didn’t want our guests to have the same bad experience. So we started our own ski school classes and asked the best local instructors to join us. We are now proud to say that we have the best reputation possible where children’s skiing is concerned, with amazing feedback from our families. 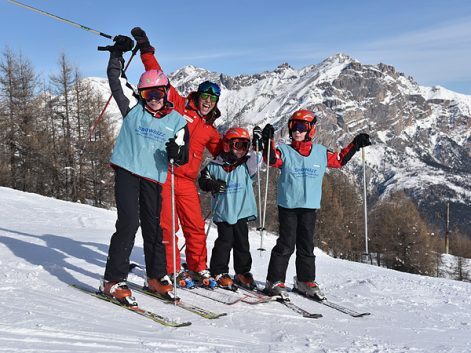 Our children’s ski school is at the heart of what Snowbizz is all about. Like the best private schools in the UK we treat every child as an individual and only employ inspirational instructors who can bring out the best in every child. We understand and love the quirkiness of kids. We know they have the same anxieties about skiing as adults, just they express them in different ways. We listen, we encourage, we explain to parents when we think some find-tuning is needed. Over twenty years we’ve learnt that you can’t put children into conveniently labelled ski school boxes, because every single one of them is on a different learning curve. When you first discuss Junior Ski School with Sarah and Jo in the office you set off a little chain reaction. Michel and the team will have spent a lot of time trying to get the first day mix of classes just right. There’s so much to consider and unlike main stream school we’ve got only six days to be perfect. We take in everything from previous achievements on snow, right through to sibling rivalry and quite commonly brothers or sisters who are at varying standards but refuse to be separated on day one. Over the first few days there can be a lot of movement between classes as children re-discover their ski legs. All our instructors carry radios and are in touch with Michel throughout the lesson, so no child will struggle or be held back and another reason why progress with Snowbizz can be quite rapid. The icing on the cake is our team of Pink Ladies who are on hand for cuddles throughout the Toton Ski School and who run the Junior Ski Club for an hour before the lesson. Going the extra mile is what makes us different and such a strong team. We are all there to support each other, and we take pride knowing that all team members will be doing whatever it takes to make your child’s ski experience as perfect as possible. The number of returning guests is testimony that we’re getting close!